I visited Japan for a two week holiday and had the wonderful opportunity to catch up with the Tokyo urbansketchers organised by the ever generous Kumi-san (see her sketches here). We visited the Yebisu Beer Museum with beer tasting. I would never have picked going to a brewery as I went to so many of them as a uni student for our studies. But the tour guide gave a good coverage of not just the way that they made it but why it got to be so popular as Japan adopted Western culture. It was great to see the different sketching style of everyone and as we had lunch and sketched around the table, we got to chat about interesting things at the same time. The sketch below is of Asakusa's Kaminarimon. I struggled with sketching it in the light drizzle but I love the effect it had on the page. I balanced the palette on a fence and had to keep adding the colour as it ran down the page. The shape of the roof of the temple/shrines aren't square so it was tough to get the shape and proportions. This shrine was engulfed by greenery and was very peaceful. A little cat wandered across which I have captured in the sketch on the right. The paper on the left hand side came out with the Mattcha and sweet at the Bamboo shrine. I am loving how you can use the pocket in the back of the Moleskine to store these tickets and ephemera to stick in once you get back to the hotel. This was my second attempt at the Matsu tree. As I am not used to sketching this kind of tree, it was a bit difficult to get the spiky look of the leaf. You can also see the "inkan" or stamp I bought at Sekaido (Art shop in Shinkjuku). The second urbansketch catch-up with Kumi-san!! It was the Sanja festival in Asakusa. Lots of people in Happi (top) and went up and down the street carrying the Omikoshi (a mini shrine). The lantern at the Kaminarimon was raised to allow the omikoshi to pass under it. An amazing fun day. We had lunch at the restaurant overlooking the Kaminarimon followed by a jazz session by Akiko-san and Ikemen-san (sorry I don't remember the guitarist's name and this is what Akiko-san called him). Although I was born in Japan, I don't get to go back as much I like. It makes it so much more enjoyable to visit a town, when guided by such kind locals such as Kumi-san. 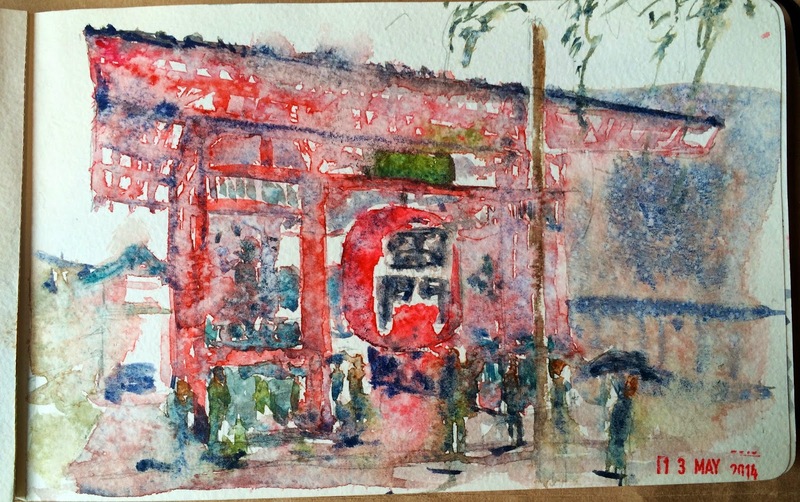 I hope you all get to sketch with the Tokyo Urbansketchers some day - as I had a ball. The rest of my sketches are on Flickr (see here).